A strong sense of pride was felt across the room as Archbishop Desmond Tutu began speaking on how former president Nelson Mandela was able to light up a room with his charismatic personality. Tutu was speaking at the unveiling ceremony of the full-length bronze statue in honour of Mandela. 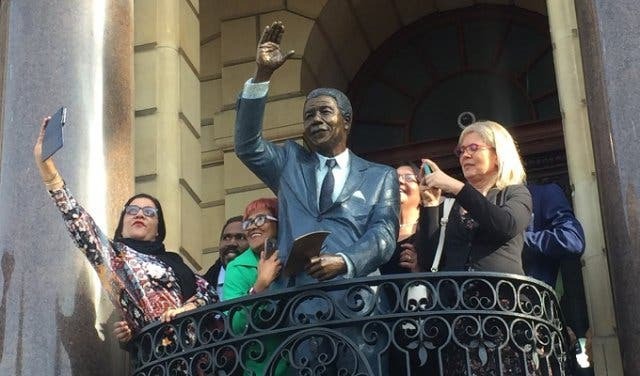 It stands on the City Hall balcony where Mandela stood when he gave his first address as a free man on 11 February 1990. 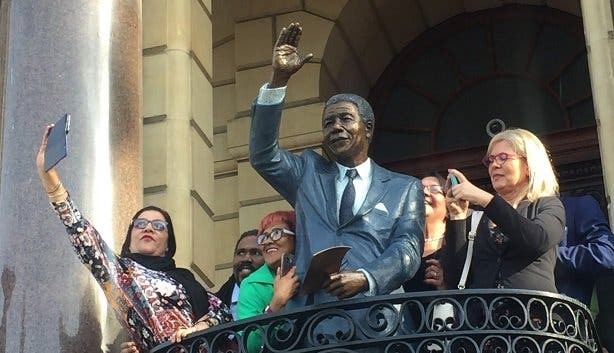 The sculpture of Nelson Mandela is also to celebrate what would have been his 100th birthday. Tutu, who attended the ceremony with his daughter, focused on how Mandela's ability to bring forgiveness to a nation scarred and hurt by Apartheid, was what set him apart from his fellow leaders. A frail but energetic Tutu said he was proud to be present at the unveiling of the statue of Madiba as it paid tribute to the great character that he was. "The healing process for our nation continues. People don't understand the conditions we were living and working under (during the transition). Madiba came and switched on a light. He made it possible for us to sit together and talk," said Tutu. Premier of the Western Cape Helen Zille also gave a speech about the moment she arrived to hear Mandela speak in 1990. She was accompanied by her husband, and the pair were front row outside the City Hall as they excitedly waited for Mandela to appear. "We didn't know what he looked like. He came out to address us and that was an 'aha' moment. When he used Winnie's (Madikizela Mandela) glasses to read because he had lost his, that was a moment that showed how human he was." The moment the statue was unveiled, loud cheers could be heard from the crowd. Clad in a light blue suit with a pair of glasses in its hands, the sculpture was warmly received. The sculpture took three to four months to complete. The artists who created the statue, Xhanti Mpakama and Barry Jackson said it was a privilege to be involved in the project. "Looking at the sculpture, I feel we succeeded in interpreting that moment for us all," said Mpakama. Jackson added that he had watched the speech 28 years ago and being able to create the statue was a moment which he couldn't properly describe in words. Want to see more of Mandela's memories? Take a look at our round-up of his special moments in Cape Town. Go on a tour of all the city landmarks and if you would like to see more footage of Madiba, watch it here. Also, don’t forget to subscribe to our newsletter and on your cellphone add capetownmagazine.com to your home screen for quick access on the go.